Among the first, and perhaps the most compelling, female private investigators of contemporary fiction, Sara Paretsky's incomparable character V. I. Warshawski at last returns to the page in her first full-length appearance since 1994's Tunnel Vision. 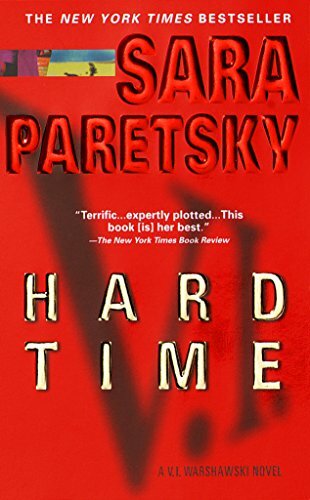 Hard Time is the work of a master--a riveting novel of suspense that is indisputably Paretsky's best V.I. Warshawski novel yet. Multimedia conglomerate Global Entertainment has purchased the Chicago Herald-Star, forcing the paper's staff to scramble to stay employed. Reporter Murray Ryerson, V.I. 's longtime friend and sometime rival, manages to reinvent himself as the host of a television show on Global's network. On her way home from a party celebrating Murray's debut, V.I. almost runs over a woman lying in the street. Stopping to help, V.I. soon learns that her Good Samaritan act will drop her squarely in a boiling intrigue. In a case that forces her to go head-to-head with one of the world's largest providers of private security and prison services, a case that exposes dark hidden truths behind the razzle-dazzle of the entertainment industry, V.I. will be ahead of the game if she gets out alive.